Bradford has a reputation as a technology leader – the City made its name in textile technology during the industrial revolution and as a result gained the name ‘wool capital of the world’. Stretching across the city’s three valleys, these woollen mills and the back-to-back terraces which housed their many workers created a street network that today is an obvious challenge for waste collection services. The sheer size of the authority is also a challenge – including the town of Keighley and other towns and villages there are over half a million residents. To manage this waste collection challenge, Bradford Council adopted RouteSmart in 2014, and its first projects were to rationalise its data sets and to undertake some smaller routing projects. More recently, the Waste Service has been charged with delivering the Council’s plan to deliver alternate weekly collections across the authority. With a previous RouteSmart user leaving the authority a new member of staff was trained and from a standing start has been involved in designing the roll-out of AWC across the authority and the implementation of routes into Fusion along with driver, management information – no small task! The Council has adopted further technology. To increase driver safety, and encourage safe driver behaviour, tracking & telematics have been fitted to the Council’s vehicle fleet. To manage its route performance and improve driver communication, the Council has deployed RouteSmart Navigator. Bradford Council required two-way messaging between drivers and back-office staff and this is now a feature available in Navigator V2. Back office staff can either send out broadcast messages and notifications to all drivers – e.g. ‘traffic delay – use High Street access to facility’ or can send and receive bespoke messages with individual vehicles. Bradford has also become an advocate of Fusion ‘in-depot’ software. 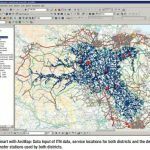 One innovation Bradford Council has introduced is by using Navigator and Fusion systematically to gather helpful service information. For example, recently, while drivers were reporting their daily service reports, they were also focusing on reporting properties with more than 1 residual bin, which could be cross-checked against records and suitable action taken. Recently, the Council’s Waste Services Manager, Fred Twiddy, attended a small group reviewing the development of Fusion and noted that the RouteSmart suite has been an important part of the Council fulfilling its service standards. Most recently, Bradford Council is making use of the Fusion API to provide detailed service and driver report information to the Council’s Customer Service Staff to increase visibility of live service information and make its responses as helpful as possible.